Global Player Casino is operated by Universal Gaming Concepts Inc. Financial transactions are processed through our parent company Universal Gaming Concepts Billing and Customer Support Ltd., 10 Ardcross, Crosshaven, Cork, Ireland. Universal Gaming Concepts Inc. holds a valid Gaming License, Issued by the Directorate of Offshore Gaming of Antigua and Barbuda. 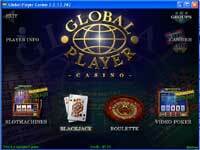 Global Player Casino doesn't offer the widest variety of casino games, but those it does - it does very well. Nice graphics, an easy installation process, and an all-around nice piece of software. Fast responding Customer Service and Fast Payouts of winnings. Global Player Casino offers New player bonuses - highroller bonuses and ongoing bonuses for regular players. Furthermore the Global Player Comps System rewards loyal players with extra free casino chips. Good betting limits for the regular smaller players and for the highrollers. Games at Global Player Casino are high quality with a very pleasant interface, the user options numerable, the web site well organized and informative, and the banking process painless. They offer one of the largest number of game variations all playable in multiplayer with chat. All Slot Machines have progressive jackpots, even the quarter slots. They offer only 4 games, but all of them the best you can find in the internet. You can test the Global Player Casino software via their guest games: you'll receive $1,000 in demo money and you'll be connected to their game server while in guest mode. This means you're playing the same games you would if you deposited real money. Of course, this requires you to be online while you play. You can find a wealth of information on their site which is a sign of Global Player Casino taking its business serious. Initial Deposit Bonus: When you make your first deposit of $30 or more you automatically are awarded $30 into your bonus balance. When you wager you are wagering from that bonus balance as long as it is there. If you win your winnings are transferred to your cash balance and your bonus balance remains the same. If you lose your wager is deducted from your bonus balance and your cash balance remains the same. Comp Program: For each $10 wagered you earn points. The very first time you log in to the casino you will be awarded 300 Comp Points. After that, you will receive 50 Comp Points for your first visit each day. Each 100 Comp Points are worth $1 bonus. Refer-A-Friend Bonus. All communications between your computer and the casino server are encrypted using SSL encryption (Secure Socket Layer). All confidential data (credit card information, passwords, PIN numbers etc.) is stored in the casino server computer in encrypted form. Global Player Casino accepts PayPal, FireCash (credit cards), Wire Transfers, Bank Draft and Personal Checks. Payouts are credited back to your credit card only for the precise amounts previously deposited. Winnings in excess of this amount must be withdrawn by bank draft or wire transfer. You can chose PayPal as well. Deposits - The official currency at the Global-Player Casino is the US Dollar. For money deposits, you can choose one of the following options - NETeller, Moneybookers, PrePaidATM, FirePay, Credit Card, Wire Transfer, Bank Draft or Personal Check. Withdrawals - Withdrawals from your casino account can be initiated through NETeller, Moneybookers, PrePaidATM, FirePay, Credit Card and Wire Transfer.